I've recently fell into the world of the podcast...I know I'm a late bloomer. 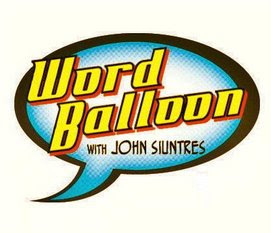 Specifically, I've been really digging comic related podcasts...particularly John Siuntres' WORD BALLOON interviews. John has a great way with an interview, and brings a real knowledge and passion for the medium to his show which shines through each episode. His choice of guests is also top notch. Siuntres manages to bring a wide array of guest from modern superstars like Ed Brubaker, and his quarterly Bendis interviews (which, say what you will about Bendis' comics, the guy is a hilarious interrview) to some of my Bronze Age favorites like Walt Simonson, Howard Chaykin and Tim Truman. Unlike some of the other comic podcasts, Siuntres doesn't "geek out" over his guests, his interviews play much more like two peers talking about the medium, and their place in it. John's background in radio broadcasting brings a welcome polish, and professionalism to the show. All in all, a great way to widdle the hours at the drawing board away. Some future episodes I would personally love to see Word Balloon hook up would be Brian Bolland, George Perez, Grant Morrison, Warren Ellis, Chris Weston and maybe a few more Canadian indy artists (ahem....). I'd also love for john to interview my buddy Dave Yurkovich (Death By Chocolate) about his recent self-published Bill Mantlo retrospective book.